In Pictures / A day for ballet at Fairfield U.
Isabel Brenner, 13, of Fairfield, reads the story to kids at the ballet story time at Fairfield University Bookstore on Friday, March 15, 2019, in Fairfield, Conn.
FAIRFIELD — The many facets of one children’s book were brought to life Friday afternoon when the Fairfield University Bookstore hosted a mini-dance class and story time. 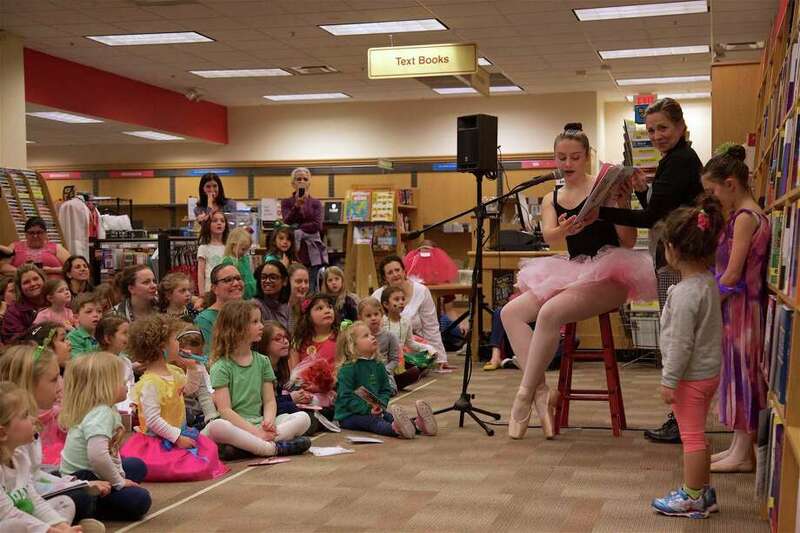 Members of the Fairfield-based Connecticut Dance School not only read the book “Fancy Nancy and the Mermaid Ballet” by Jane O’Connor to an engaged roomful of kids and parents, but shared details on dance. “It’s extremely popular,” special events coordinator Nancy Quinn said of the book. Along with the story, different ballet positions, pirouettes and plies were demonstrated and taught. “It’s just showing them what dance can be,” said Elizabeth Gaynor of Southport, who founded the school 50 years ago. Dozens of kids came in costume as both ballet dancers and mermaids, and in some cases both. “I see the enthusiasm and the excitement with children,” Gaynor said.